Alto saxophonist De Lucia is committed to music that springs from Lennie Tristano. He also draws on the examples of Lee Konitz, Jimmy Giuffre, Gerry Mulligan and other musicians who became important in the late 1940s and early ‘50s. 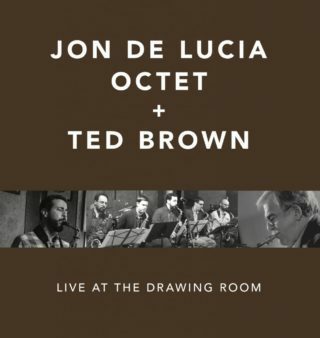 On this album De Lucia’s octet features the venerable tenor saxophonist Ted Brown. Brown spent seven years with Tristano after the pianist, composer, arranger and theorist moved from Chicago to New York and established a modern jazz tributary often referred to as the Tristano school. Tristano influenced a wide range of musicians including Bill Evans, Clare Fischer, and the saxophonists Konitz and Warne Marsh, both early members of his band. Tristano’s impact is apparent in the harmonic aspects of the De Lucia album’s arrangements of standard songs like “Darn That Dream” and “The Song Is You” and of modern jazz classics including Mulligan’s “Sextet,” his “Venus De Milo” and the Jimmy Giuffre arrangement of Konitz’s “Palo Alto.” In this video made at New York’s Drawing Room, the bearded man near the middle of the screen is De Lucia. To his immediate right is Ted Brown, mostly obscured by the audience but fully audible in his solo. The piece—based on guess what?—is titled “I Resemble You,” not the only track in the album to borrow from the chord structures of well-known compositions. Members of the band: De Lucia and John Ludlow, alto saxophone; Jay Rattman and Marc Schwartz, tenor saxophone; Andrew Hadro, baritone saxophone; Ray Gallon, piano; Aidan O’Donnell, bass; Steve Little, drums; Ted Brown, tenor sax—featured guest. To learn about Jon De Lucia’s background in Boston and New York, visit his website. I’ve heard this group before sans Ted Brown. Mr. Brown was one of my favorite tenor-men back in the late fifties. He still sounds well; this band of Jon’s is perfect for him. Nice post.